William Morrow Paperbacks, 9780061624773, 416pp. In the tradition of The Thirteenth Tale, Brunonia Barry’s bewitching gothic novel, The Lace Reader, is a phenomenon. Called “[a] richly imagined saga of passion, suspense, and magic” by Time Magazine, it is a haunting and remarkable tale told by an unforgettable, if strangely unreliable narrator—a woman from an enigmatic <?xml:namespace prefix = st1 ns = "urn:schemas-microsoft-com:office:smarttags" />Salem family who can foretell the future in patterns of lace. 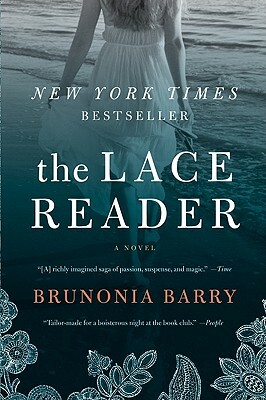 The Lace Reader was a runaway New York Times bestseller—hitting the top lists in major cities across the country, from Boston to Chicago to Los Angeles—and has immediately established debut author Brunonia Barry as a major force in contemporary American fiction. The author states that The Lace Reader is, at its core, about perception vs. reality. How does Rafferty's perception of Towner color his judgment of what she says and does? What about Rafferty's perception of Cal and his actions? At the very start of The Lace Reader, Towner Whitney, the protagonist, tells the reader that she's a liar and that she's crazy. By the end of the book do you agree with her? Eva reveals that she speaks in cliche so that her words do not influence the choices made by the recipients of her lace reading sessions. Do you think that's possible? Can a cliche be so over used that it loses its original meaning? When May comments on the relationship between Rafferty and Towner, she states that they are too alike and predicts that "You won't just break apart. You'll send each other flying." Did you agree with that when you read it? And if so, in what ways are Towner and Rafferty alike? The handmade lace industry of Ipswich quickly vanished when lace making machines were introduced. At that same moment, the economic freedom of the women making the handmade lace also evaporated. Why do you think that these women didn't update their business, buy the machines, and own a significant portion of the new lace making industry? Do you think that May's revival of the craft of handmade lace with the abused women on Yellow Dog Island is purely symbolic or could it be, in some way, very practical? What role does religion play in the novel? Is there a difference between spirituality and religion? Between faith and blind faith? Towner has a special bond with the dogs of Yellow Dog Island-do you agree that people and animals can relate to each other in extraordinary ways? How do the excerpts from The Lace Reader's Guide and Towner's journal function in the novel? Does the written word carry more truth than the spoken? Did you use the clues in the Guide to help you understand the rest of the book? How much does family history influence who a person becomes? Do you believe that certain traits or talents are genetic and can be inherited? Is it possible that twins share a unique bond and how does being a twin affect Towner? Can geography influence personality? For instance May lives on an island, does this say something about her?